American Catholicism's second-largest annual gathering took place again over the weekend... and, as ever, the traditional barely-batted ad intra eyelid remained mostly intact. Yet while a crowd of close to 70,000 returned to a rainy downstate Missouri field for the 31st Marian Days -- and the cardinal-archbishop of Ho Chi Minh City presided at the five-day, 30-acre campout -- this year's edition of the Vietnamese-Catholic jamboree took place under a pall as attendees mourned the death of 17 pilgrims en route from the Houston area, whose bus overturned and burst into flames in a crash north of Dallas. At least 40 others were injured in the Friday morning wreck, likely caused by a blown tire. Chartered by members of two Vietnamese parishes in the Galveston-Houston archdiocese, the bus company at fault was operating illegally and without insurance, according to federal investigators. While the Days -- started in 1975 by a small band of postwar refugees who settled in the Show Me State -- enjoyed several years as the Stateside church's largest "family reunion," that honor now belongs to the 130,000 or so who converge each 12 December on the Guadalupe Chapel at Maryville, outside Chicago. 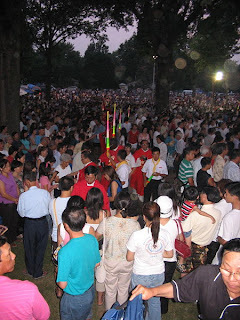 Both testimony to the continuing ascendancy of the US fold's "new immigration," the rising festivals stand in distinct contrast to the marquee meet-ups of bygone years, instead emphasizing the bedrock traditions of faith and culture as attendees gather simply to eat, pray, celebrate and give thanks together for graces received. Given that, no wonder they just keep on growing... and, even amid great tragedy, get nowhere near the attention they deserve.